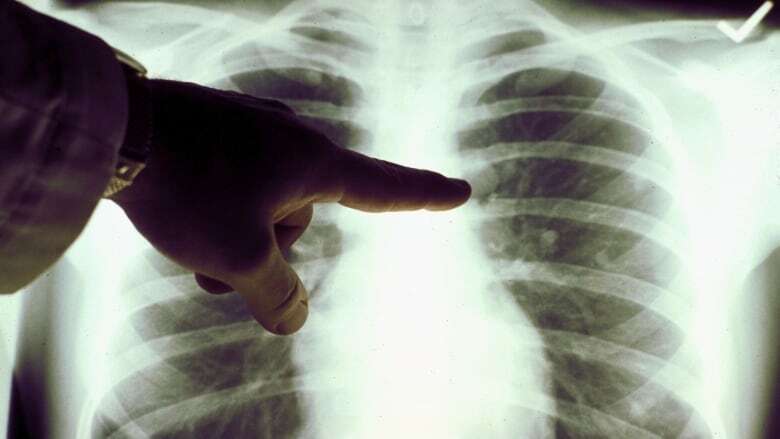 will die from the disease, a new report by the Canadian Cancer Society predicts. 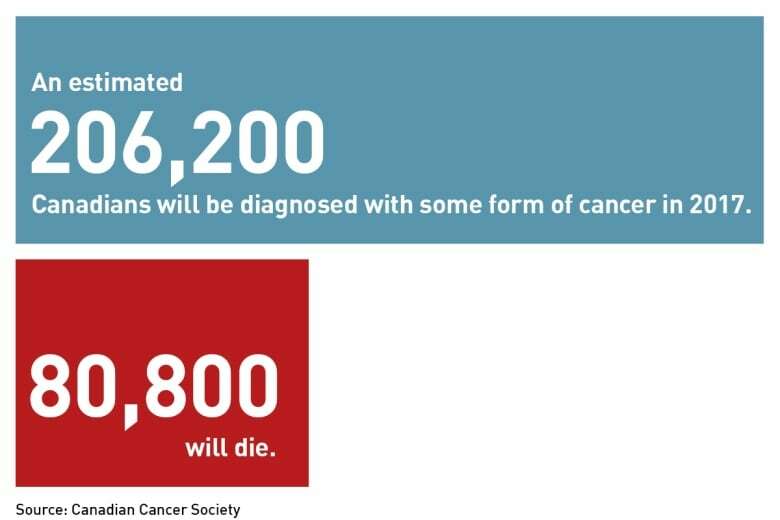 In 2017, an estimated 206,200 Canadians will be diagnosed with some form of cancer and an estimated 80,800 will succumb to their malignancy — making cancer the leading cause of death in Canada, the charitable organization said Tuesday in its annual cancer statistics report. "Currently, every year we're seeing an increase in the number of cancer cases in Canada," said the society's epidemiologist, Leah Smith. "So between now and 2030, for example, we expect to continue to see a dramatic increase in the number of cancers diagnosed in Canada. "That is a reflection of the growing and aging population," she said. "About 90 per cent of all the cancers that we expect to be diagnosed in 2017 will be among Canadians 50 years of age and older." About 45 per cent of those cases will occur in people age 70 and older, said Smith, noting that as more people move into old age, the number of cancer cases will rise. 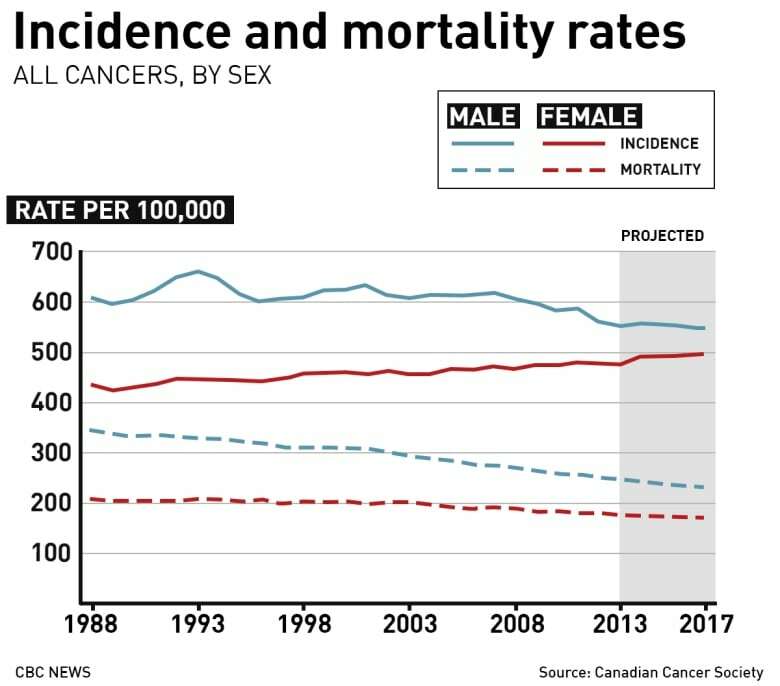 Despite the projection that cancer will cause the deaths of one in four Canadians, cancer mortality rates have been declining since their peak in 1988. Over the past three decades, deaths due to cancer have fallen by more than 30 per cent among men and by about 17 per cent among women. "Declines in death rates have been largely driven by decreases in lung cancer incidence and mortality, so tobacco control in general has had a big impact on our death rates," Smith said, especially among men, who historically had higher smoking rates than their female counterparts. Increased rates of screening for breast cancer and improved treatments have also bolstered survival among women. Still, four cancers — prostate, breast, lung and colorectal — continue to top the list of the most common malignancies, which together are expected to account for more than half the cancer diagnoses in 2017. Lung cancer continues to take a huge toll: more people are predicted to die of the disease this year (21,100) than from a combination of the other three cancers (19,200 in total). Sarah Metcalfe, of Ottawa, is all too familiar with the ravages of cancer, which has affected eight people in her family. When she was a child, an aunt died of breast cancer. But cancer really hit home when Metcalfe was a new mom in her early 30s and her husband developed osteosarcoma in his upper arm, which was successfully treated with a bone transplant and long courses of "dramatic" chemotherapy. About the same time, three uncles succumbed to lung cancer, mostly due to smoking, and then her father developed fatal colon cancer. "I thought that's got to be it now," said Metcalfe, 58. But is was not to be: her brother was subsequently diagnosed with skin cancer, though he is "doing well," she said. "And then I had my turn." In 2011, Metcalfe learned she had breast cancer. "Just as I'd finished treatment, my mom found a lump on her thigh" that turned out to be a soft-tissue sarcoma. Despite treatment, the cancer spread and her mother died about two years later. 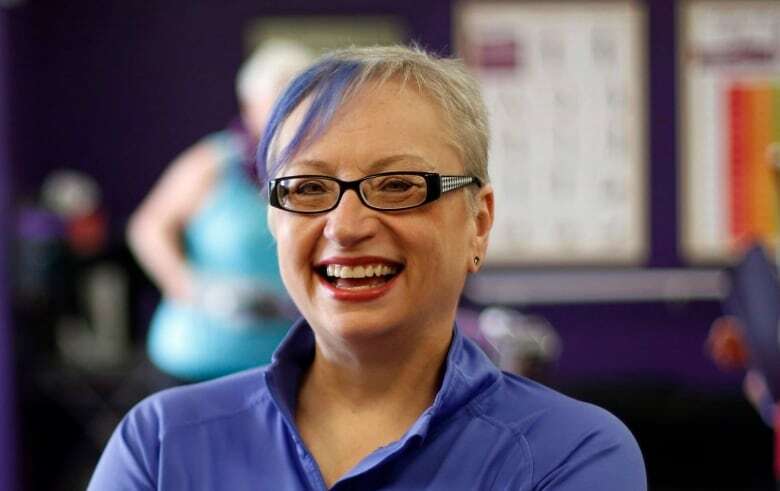 "That's it so far," said Metcalfe, who as the owner of two women's fitness centres in part credits regular exercise and maintaining a healthy diet with her five-year survival. 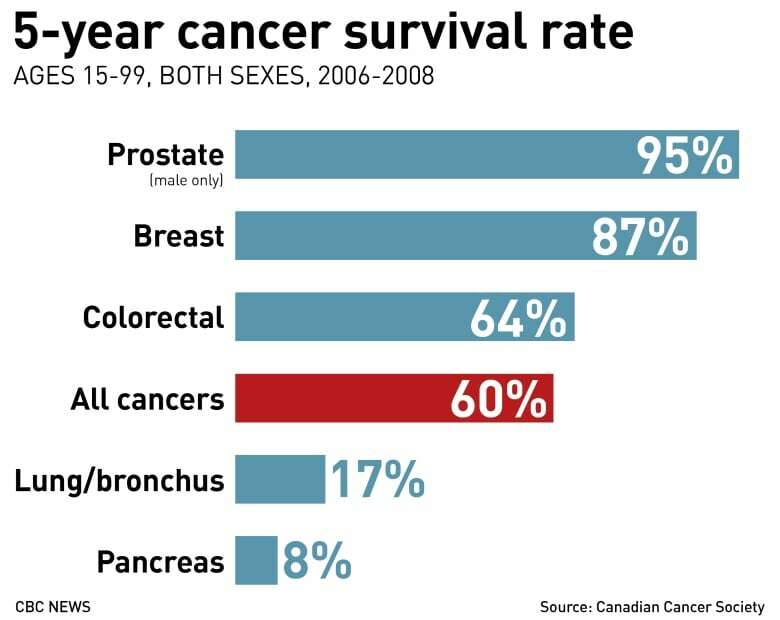 Survival rates for some cancers have improved dramatically over time: overall, 60 per cent of Canadians diagnosed and treated for cancer will survive five years or longer, said Smith. But that's not the case for pancreatic cancer. With an eight per cent five-year survival rate, the gastrointestinal cancer has the poorest prognosis of the 23 malignancies the Canadian Cancer Society reports on. This year, an estimated 5,500 Canadians will be diagnosed with cancer of the pancreas and 4,800 will die of the disease. "Unfortunately, we're seeing very little improvement in pancreatic cancer, not just in Canada but around the world," said Smith, pointing out that the report has a special focus on the disease in a bid to raise awareness and designated funding for the cancer. Dr. Jolie Ringash, a radiation oncologist at Princess Margaret Cancer Centre in Toronto, said pancreatic cancer is challenging to treat because tumours don't typically cause symptoms — abdominal or back pain — until they are at an advanced stage. "It's one of the areas where we really have not seen significant breakthroughs in 50 years," she said. "So the lucky ones are where it's found very early, often by chance because the [patient is] having tests for some other reason and there's a tiny cancer that can be surgically removed. "That's the good-case scenario. But unfortunately, the vast majority of these tumours progress within the abdomen, don't cause any symptoms for the longest time, and by the time they're recognized they're very advanced and treatments aren't very effective." Ringash said more research into the causes of pancreatic cancer is needed, which could help lead to a screening test that could to pick up tumours when they're small and more treatable. Researchers hope to find a biomarker in the blood — similar to the PSA test used to screen for potential prostate cancer in men — but she said more research dollars are needed for such screening and to develop much better treatment. Unlike with breast cancer and prostate cancer, where survivors and their families and friends often hold events to raise awareness and research funding with the goal of finding cures, the issue of pancreatic cancer seems to fall below the public radar and suffers as a result, she said. "We don't have enough survivors out there pounding the streets and doing the walks and raising the money."